There has always been a rule that 33rd degree rings are to be made ONLY of gold. It caused quite a stir when Frank S. Land, the founder of Demolay, had a ring crafted of silver. And he wore it! There's no question about it--that's absolutely true. But years later, a rumor started that Harry S. Truman, after he received his 33rd degree, was seen also wearing a silver 33rd ring. As a Past Grand Master of Missouri, and a former President of the United States, the idea he would have worn a 33rd degree ring made of anything other than gold caused quite a controversy amongst Scottish Rite Masons. Some said it simply wasn't true--that Truman never owned or wore anything other than a gold ring. 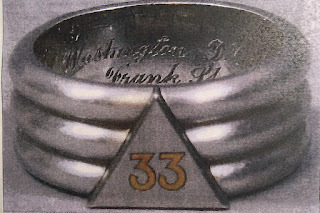 Others claimed the ring he was seen wearing was actually Frank Land's ring--they were friends. But Harry's silver ring never turned up, so as time went on most people believed it was probably just a rumor--a myth. 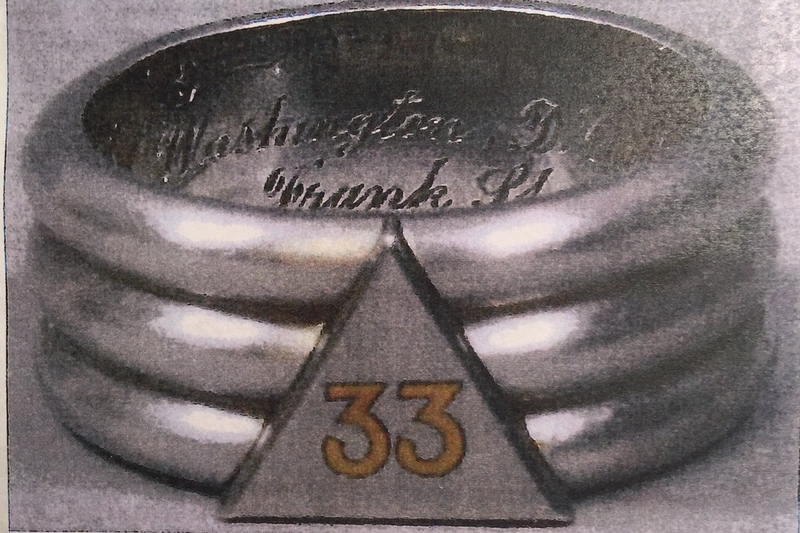 When I received my 33rd degree in 2011, I asked one of the active members of the Supreme Council about the rumor that Harry S. Truman wore a silver 33rd ring. I was told very curtly that it never existed. I was also reminded that in the Northern Masonic Jurisdiction, 33rd Degree Masons were to ONLY wear the ring they were given. I wasn't to even think about buying one of those flashy 33rd rings with the lacquer and diamonds. There were rules about such things after all. And there was absolutely no evidence what-so-ever that Truman ever owned, wore, or had a ring like that made. Case closed. It's false, right? Well guess what turned up last December? That's right. A silver 33rd degree ring. Harry S. Truman's silver 33rd degree ring no less! And we even know now where it came from. In hindsight, it makes perfect sense. It was inscribed inside to Harry S. Truman . . . a gift from Frank S. Land. The Missouri Lodge of Research's 2016 Truman Lecture will mark the first time that both of those silver rings will be exhibited together. But what's really odd is just about the time that ring surfaced, something else vanished! That article I wrote some years ago claiming that ring was most likely a myth because there was no evidence it ever existed. Odd, huh? On display at the Henry E. "Hank Stickney DeMolay International Service and Leadership Center is Dad Land's 33rd ring and photographs of President Truman and Dad Land both wearing their rings. On May 21, 2016 the two rings were together once again in a grand celebration at the Truman Library in Independence, MO. What a great event it was! I really wanted to attend that event--I'm a Fellow in the Missouri Lodge of Research. I got a few of the facts for this piece from the Missouri Lodge of Research newsletter that published a short piece on the subject prior to that event. Thanks for the comment! As I understand it the rings were in fact platinum. Any word on that? My information is that they are made of silver.